The David J. Yvars (DJY) Group has the type of collective expertise and experience that you can take comfort in. When you forge a business relationship with us, you can feel confident knowing that you're partnering with a seasoned group of professionals dedicated to providing you the best service and advice possible. As your Financial Advisor, we believe it is our utmost responsibility to provide sound financial planning and investment advice based on our clients individual sets of circumstances. After more than 30 years in the industry, we've learned the value of sticking to the plan in the face of wild highs and distressing lows, and we believe this approach is more significant today than it has ever been. Developing a sound investment plan and following it closely can be challenging in today's sometimes confusing and fluctuating financial markets. As assets grow, so do the complexities of managing investments and accurately assessing their performance. Without clear direction, some investors may be inclined to sit on cash for extended periods of time or time the markets. These typical investment traps can steadily erode the likelihood of achieving individual goals and realizing expected return objectives. At the same time, many investors have neither the time nor the analytical tools to manage assets properly. They require professional assistance to review their personal sets of circumstances and existing asset allocations in detail, define return objectives and risk tolerance, establish, implement and manage an appropriate customized investment strategy, and carefully monitor performance with rebalancing recommendations. Until recently, this kind of multi-dimensional service was limited to large institutions and the wealthiest individuals. With the David J. Yvars Group, we’ll be able to fully customize your portfolio after establishing your risk tolerance and return objectives utilizing individual securities, mutual funds and exchange-traded funds. Finance affects nearly every part of a person's life, so we believe in developing financial plans that are just as far-reaching. Our process begins with a full review of a client's needs and objectives. Then, with goals identified, we start planning for everything from asset allocation and reallocation to trust creation and insurance selection. We utilize Goal Planning and Monitoring (GPM) software. GPM is a very sophisticated, yet easy to understand application that enables us, as advisors and clients quickly identify client goals to assess appropriate asset allocation targets, spending or savings rates, and the probability of achieving those goals. Risk is an inevitable - but manageable - part of life. As we design and implement portfolios for our clients, our goal is to minimize the negative impact of market volatility. And as we develop larger financial plans, we work with each client to make decisions about life insurance, annuities and long-term care based on his or her unique needs. As part of our program, you can take advantage of The David J. Yvars Group CPA/Attorney Network to review your existing tax or estate plan, or if you do not have a plan in place, to customize one for you. Our network of independent CPAs and trust and estate attorneys can help meet your comprehensive estate and tax planning needs. There is no fee for an initial consultation, but fees apply for any subsequent consultations. At your option, the network CPA or attorney can help prepare a basic estate or tax plan for you at a pre-disclosed, fixed fee. All of the CPAs and attorneys in the Network have at least 20 years of tax or estate planning experience. Contact us to learn how our CPA / Attorney Network can help meet your estate or tax planning needs. Are You ... Changing Jobs? Changing Careers? Retiring? If you are receiving a distribution from a company retirement plan, there are important decisions you need to make ... sooner than you may think. How will you preserve the retirement funds you have accumulated to provide the income stream you will need for your future? There are several options to consider that can help you protect the security you've earned from unnecessary or untimely income tax treatment. Let us show the way by using our experience and knowledge in the IRA / retirement plan landscape. A carefully considered retirement income plan can increase your chances of making your money last as long as you need it. There are many factors to consider when it comes to funding a secure and fulfilling retirement. 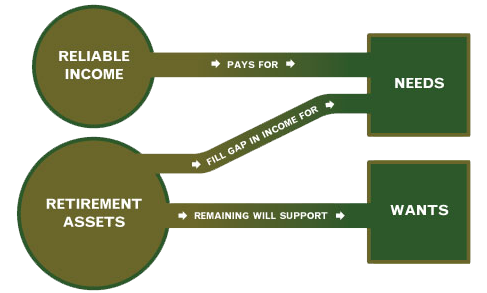 We have created a simple framework that illustrates how four key elements – reliable income, retirement assets, needs and wants – work together to provide a clear picture of your income sources and how they’ll pay for retirement expenses in the years to come. We’ll start by identifying and defining the key elements of your retirement picture. Expenses that are nonessential, but ideal in retirement. They reflect your vision of retirement. The four key elements – reliable income, retirement assets, needs and wants – work together to create a clearer understanding of your financial picture and the income sources that will be used to cover retirement expenses. It highlights how much of your assets will be able to fund the gap in income for your "needs" as well as your "wants" each year. The goal, of course, is to develop a retirement income plan that helps you feel secure for the next 20 to 30 years or longer. Then you’ll have the freedom to make your own choices about what retirement means for you. Understanding how these elements work together is the first step in creating a personalized retirement income plan. The David J Yvars Group can help you develop a holistic strategy to manage risks and fund a comfortable and secure retirement. Other factors may also impact your retirement, which is why we’ll weigh your priorities and discuss trade-offs that could help secure your retirement and accomplish key objectives. The David J. Yvars Group, Inc. It is agreed that at least 48 hours prior to signing any investment advisory agreements to participate in any product or service mentioned in this site, The David J. Yvars Group, Inc. Form ADV Part 2 A and B will be reviewed. This site is published for residents of the United States only. Yvars Group, Inc. financial advisory may only conduct business with residents of the states for which they are properly registered. Therefore, a response to a request for information may be delayed. Please note that not all of the investments and services mentioned are available in every state. Investors outside of the United States are subject to securities and tax regulations within their applicable jurisdictions that are not addressed on this site.